Main frame is 69” square x 256” tall, modular carbon steel 4” square x 1/4” wall structural tube with continuous welds. 2-ton air hoist with motorized trolley, nylon energy chain package, and Spider-Lift™ bag lifting frame. Stainless steel bag support pan. 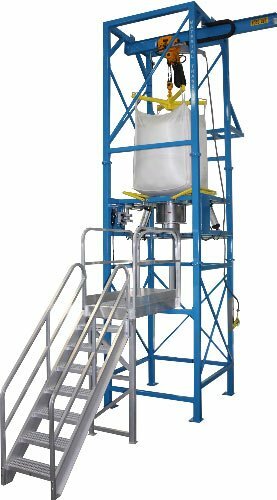 Flo-Master™ bulk bag massaging system with tubular frames promotes material flow. Seal-Master™ bag spout access chamber with “gull wing” doors for optimal access to bag spout tie. Stainless steel Sure-Seal™ pneumatic spout clamping system seals bag spout for dust-tight discharge. Unit features an integral aluminum operator access platform with railings. Custom lower frame designed to accept customer’s existing hopper and feeding system (not shown). Upper frame features supports for customer’s existing dust filtration system (not shown).